Check out this message from Ben & Jerry(the ice cream guys) and Senator Nina Turner on the mission and goals of Stamp Stampede. The goal of stamping paper currency is to get these anti-big-money and pro-voting rights messages stamped on your bills seen by as many people as possible. Now you can be a casual stamper and not follow stamping tips or you can be an expert stamper and follow them. We love all stampers. But we love expert stampers more. Avoiding the bill being classified as “soiled money” and being kicked out by the automatic scanners when it gets to one of ten Federal Reserve Banks around the country. Now that you know where to stamp your bills the only thing that could go wrong is that you fail to abide by the watchword of our movement: TKITKOS – The Key is to Keep on Stamping! The earliest calls for women’s suffrage in England began in the nineteenth century, with local women’s groups organizing petitions. But by 1903, frustrated with the movement’s lack of progress, the Women’s Social and Political Union (WSPU) was founded by Emmeline Pankhurst and her daughter. And from 1905 onwards WSPU used new tactics including civil disobedience, rallies, and demonstrations. This coin was part of that civil disobedience. 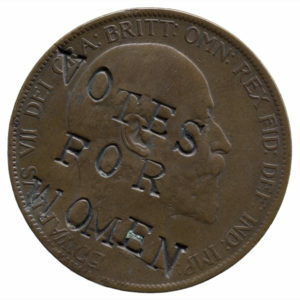 Stamped with the suffragette slogan “votes for women”, it circulated as small change and spread the message of the campaign until the law giving women the same voting rights as men was passed in 1928. The women in the suffrage movement tapped into the viral circulation of money to demand their fundamental right to vote. Now, 100 years later, we’re fighting to defend the power of everyone’s vote. Big money has corrupted our elections and undermines the fundamental principle of “one person, one vote.” So we’re doing what the suffragettes did. We’re building a movement of dedicated citizens rubber stamping messages like “Not to Be Used for Bribing Politicians” and “Stamp Money Out of Politics” to create a “petition on steroids” that Congress and the entire country cannot ignore. We’ve already recruited over 100,000 stampers, and we’re just getting started. We’re growing faster than ever before, building a movement united in massive and sustained protest to overturn Citizens United and restore a government of, by, and for the people. The goal of stamping paper currency is to get the anti-big-money message on the bills you stamp seen by as many people as possible. You can be a casual stamper and not follow the tips below or you can be an expert stamper and follow them. We love all stampers. But we love expert stampers more. Making the stamp on the bill as visible as possible so that people can’t miss it when they receive the bill. Avoiding the bill being kicked out of circulation by the automatic scanners when it gets to one of ten Federal Reserve Banks around the country. Download the Complete Guide to Stamping here.